While growing up in Pakistan, it was hard to appreciate the elaborate artwork on each and every truck and bus that was on the road. It was ubiquitous. That was the norm. But, of course, now there is a new appreciation. And several books have now addressed the topic of Pakistan's art of wheels. The newest book is On the Wings of Diesel: Trucks, Identity, and Culture in Pakistan by Jamal Elias. 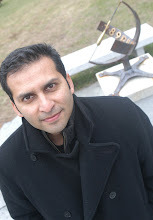 He used to be at Amherst College but is now is a faculty member at UPenn. His book uses this truck art to find the story of contemporary Pakistan. 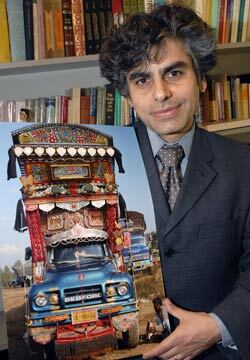 He provides a nice background on Pakistan's history, education structure, religious varieties, and then takes on the role of trucks in Pakistan, those who drive them, and those who decorate them. The strongest part of book, apart from the spectacular pictures, deals with the analysis of the images - from religious symbols (Shi'a truck, tablighi truck, etc) to political signifiers (Saddam Hussein, AQ Khan, etc) on the back of the trucks. In fact, Jamal also discusses why this very truck art is now a celebrated topic amongst the educated-elites of Pakistan. Check it out - it is a fantastic interdisciplinary book.